Fig. 1. STM images of the surface of an Fe film grown on a vicinal Cu(001) surface. Dotted lines indicate substrate step edges. (a) Image including three steps. (b) High-resolution image indicating growth of an fcc Fe film with a square surface lattice on a narrow terrace. Large protrusions on the terrace are adsorbed CO atoms. (c) High-resolution image indicating growth of both the fcc Fe film and an Fe film with complicated surface structure on a wide terrace. On the surface of lower terrace, the right region has a square lattice, and the left complicated lattices. About 80 % of the latter surface is covered by CO atoms forming local 2 × 2 structures. (d) Magnified image of the fcc Fe surface. 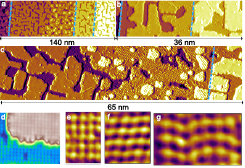 (e-g) Magnified images of the left region in (c) with adsorbed CO atoms. Square (e), p2mg(2 × 1) (f) and, nano-martensitic (g) lattices are recognized. Fig. 2. (a) Atomically-resolved STM images in the fcc region with masked (left) 7 and (right) 6 ML thick Fe films. (b) FFTs of the images in (a). (c) The values of the surface lattice constant, a6 and a7, extracted from different STM images of the 6 and 7 ML fcc Fe films. The error bars represent the standard deviations. In hetero-epitaxially grown thin films where designed electronic and magnetic properties can be sustained, an appropriate choice of the substrate is crucial to keep the matching of the lattice symmetry and constant. However, transformation of the crystal structure from the epitaxial one to the bulk stable one with increasing the film thickness often disturbs the characterization and uses of intrinsic electronic and magnetic properties of the epitaxially-stabilized phases. We have found that high-density steps on a vicinal Cu(001) substrate can stabilize the epitaxial fcc Fe overlayer against transformation towards the bulk stable bcc phase with increasing the coverage . Here, the steps serve as strain relievers for stabilizing the epitaxial film. The fcc Fe phase has experimentally and theoretically attracted a great interest over two decades because of its complex magnetic structures. The growth on a flat Cu(001) substrate are well defined in previous studies , and the structural transformation from fcc to bcc Fe is implied by the appearance of the surface reconstruction . Figure 1 shows STM images of the surface of a Fe film on the Cu(001) surface. The average Fe thickness is 6.9 ML. The narrow terrace consists of 6 and 7 ML thick films and the surface atoms make a square lattice as in Figs. 1(a,b,d), indicating growth of the fcc Fe film. 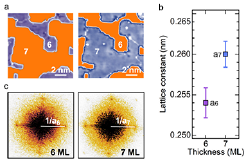 Each wide terrace has two regions; one is the same as the narrow terrace, and the other consists of 6, 7 and 8 ML thick films with complicated surface lattices with ~ 80 % coverage of adsorbed CO atoms as in Figs. 1(a,c,e,f,g). The latter region, where small areas of fcc(001), p2mg(2 × 1), nano-martensitic and bcc(110) lattices are seen, is found always at the lower side terrace of the atomic step. The width of the fcc Fe region increases with increasing the terrace width. This suggests the strain-relief due to the step edge stabilizes the fcc film even 7 ML thick. The strain relief due to the step edge was directly confirmed using surface atomic images as in Fig. 2. On the fcc region, the surface lattice constant of the 7 ML film is ~ 2.4 % larger than that of the 6 ML film. The difference of the local electronic states observed by atomic-layer resolved scanning tunneling spectroscopy was attributed to that of the lattice constant . 1. T. Miyamachi et. al., Phys. Rev. B 94, 045439 (2016). 2. H. L. Meyerheim et. al., Phys. Rev. Lett 103, 267202 (2009). 3. A. Biedermann et. al., Surf. Sci. 563, 110 (2004).